Following up on my first post, I’ve put together some simple, static prototypes of the Speakers block. 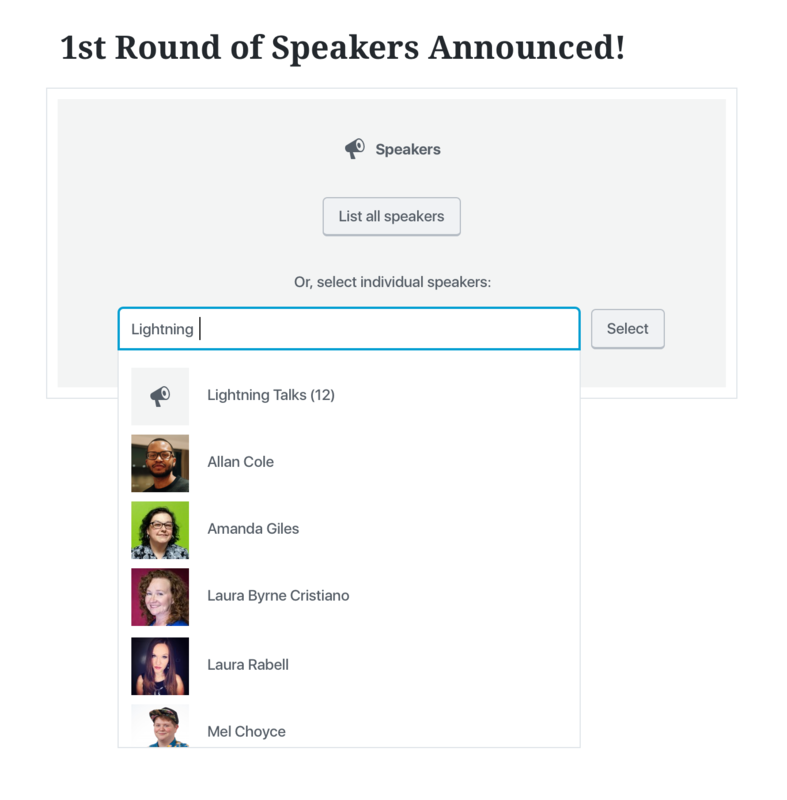 Have you ever wanted to easily announce a keynote speaker, or showcase your latest round of speaker selections in a post? This block will allow you to showcase specific speakers. Note, this prototype does not include settings — it focuses on the flow of adding individual speakers. Sometimes you just need a list of all of your speakers. This prototype explores that flow, along with the optional settings you can use to customize its design. This prototype does include settings! Please play around. Would you use this block for your WordCamp? Does this seem to give you more options, or less options, than working with the shortcode? Keeping in mind this is a static prototype, did everything work as you expected? Did anything not work as you expected? Did you find anything confusing? Do you feel like this block is missing anything? It seems like selecting all speakers is the most common use case, so I wonder if that should be the “primary” / first option in the placeholder, instead of selecting individual speakers? Thanks for all the work on this @melchoyce! In the sidebar settings, I think the information hierarchy could use a little refinement. There are a lot of settings and it can be a bit challenging to scan. For example, it looks like S/M/L/XL are options under the heading “Show Photos”. 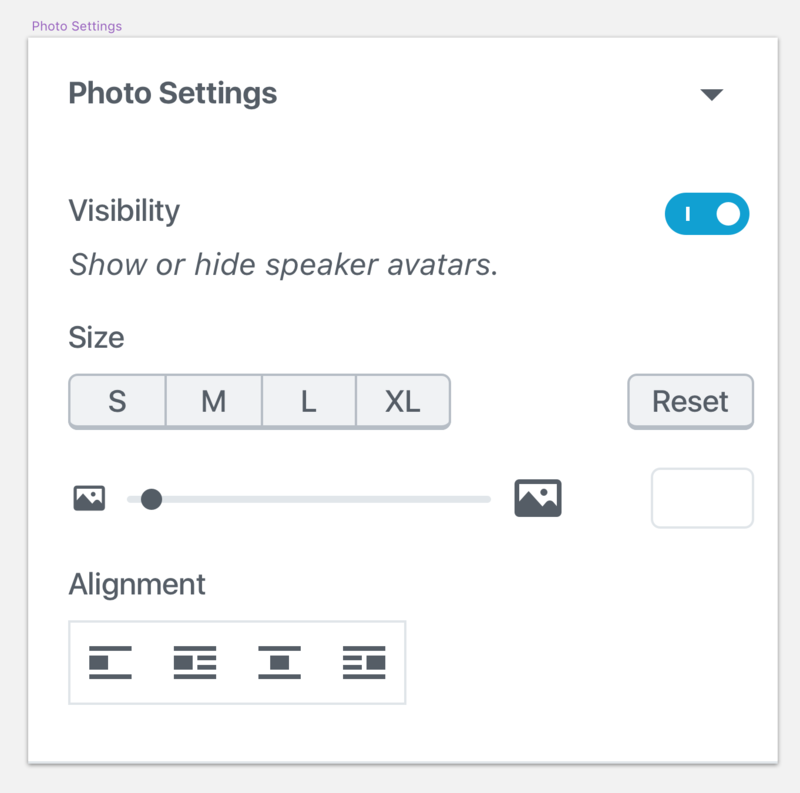 So, perhaps the subheadings in the Photo Settings section could be “Visibility”, “Size”, and “Alignment”, with the appropriate tools bundled under each heading? Just to clarify — is this what you’re thinking? For the option to list all speakers, it would be great if we could also filter that by the Speaker Groups taxonomy (wcb_speaker_group). Many WordCamps announce their speakers in separate groups and using that taxonomy is the easiest way to do that. The current speakers shortcode allows you to do that, so it would be great if we could do that in this block too. In terms of UI, I was thinking to add a wcb_speaker_group taxonomy dropdown on the same row as the “list all speakers” button that defaults to “all groups”, but the dropdown only shows if terms have actually been added to the taxonomy. I’d love to hear more from organizers whether being able to select specific people in the block would be a better or worse experience for curating announcement posts. What would the ideal process be for organizers? I like the idea of being able to select just individual speakers from within the block. In terms of process, it seems like it improves it a bit. It seems like it will shave a few steps off, but we also won’t have to upload all of those images, saving some space on the server. Yes, you can use the gravatar shortcode, but I’ve always had difficulty getting that shortcode to behave the way I want it to. I’ve always done this by using the taxonomy, as it means you can add them to the taxonomy term when creating/editing the speaker ans then when creating the announcement post, you just select that taxonomy instead of doing it one by one. 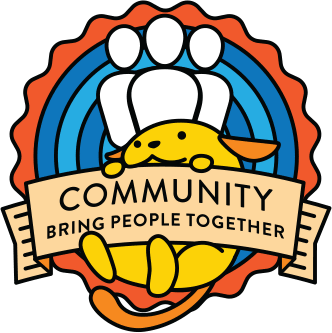 I imagine the taxonomy use case would be very beneficial for large camps like WCUS/WCEU, but that’s my assumption – the most speakers we’ve had at any one camp has been about 20, so doing them individually wouldn’t be a huge issue, but using the taxonomy would make it slightly easier. If we went the route of only adding the taxonomy drop down if terms have been created, but we always have the individual speaker selection box anyway, then this would only create a new UI element for folks who will actually use it. I suppose we could set up a group for each speaker round. When selecting individual speakers, it would be nice to have the ability to reorder the speakers once they’re on the page. It seems like the only way to do that would be to add multiple speaker blocks to the same page so that you can shift them around more easily. I was thinking you’d be able to reorder the speakers manually, using the up/down arrows. Each speaker would work like a block inside of a column block. At what point in the process would you expect to be able to select a group? It would be cool for this to function similarly to the way links do now. You start typing in the dialog and if you type in a group, then the group option shows up in the dropdown. In this mockup, I’m showing both the speaker group and the speakers within that group. Would you find this confusing? This looks great. I like that the speakers within that group show when you search for a group. Reordering using the arrow keys sounds great! After an individual speaker is added, what do you think would be the best UI for removing them? Something similar to the Gallery block, perhaps? I like the way the gallery block functions. Being able to hit that X after you’ve done the initial config makes a lot of sense. Looks super good! Seems to be a kind of thing that I just imagined in some distant future. Good job! Keeping in mind this is a static prototype, did everything work as you expected? Did anything not work as you expected? Did you find anything confusing? I’m not currently and admin on a WC site. It’d be nice to have an option to use another photo or a bigger one. +1 to being able to use a different photo. @bridgetwillard @jenniferswisher I’m not sure we’ll be able to get different photos in to the first round of this block, but there’s a workaround — you could hide the speaker’s gravatar, and then add a new photo into the post content and show their full bio. Would that work in the meantime? @melchoyce that’s what I do currently. 🙂 I’m totally fine with doing that for now.